View of the beach in Poipu from the Sheraton property. We were originally planning to come to Kauai on the Marriott Vacation promotion, which included 5 nights at the Marriott Beach Club in Kauai. We wanted to extend our stay, so we planned to stay at the Sheraton for 2-3 nights. After the original plans fell through, we booked 5 nights at the Sheraton using Starwood points (well, we paid for 4 and got the 5th night free! ), and then, because we didn’t have enough Starwood points for a full week, we used some of our Chase Sapphire points to reserve the next two nights. We loved it in Poipu and we’re so glad we decided to try something different from last time (and we can’t wait to go to a different island maybe next year?! I can dream, right?). Kauai feels a lot less crowded/touristy, but it’s so beautiful and still has plenty of things to do. Our trip felt a lot different this year because there isn’t much relaxing to be had when there’s a 7 month old with you, but we thoroughly enjoyed ourselves! Price. I didn’t pay too much attention to the stated price online, since we never planned on actually paying. We paid 12k Starpoints for 4 nights (and for the 5th free), and then we booked two nights through Chase, for 52,773 points (which translates to $791.60). I do want to mention that there is a $31.25 resort fee per night, so even though we reserved “free” nights, we still have to pay it. It’s mandatory and it includes: free self park (because I’m a Gold member we were gifted free valet for the duration of our stay, which was very nice since we used our car a lot and generally had a lot of stuff to carry), two water bottles per day, 24-hour access to the fitness center, activities (such as lei making, yoga, and hula lessons), phones calls, and nothing else too exciting. The hotel is not cheap, but it seems like a good deal in terms of point redemption (compared to other hotels at the same level). We’ll see how it changes once Marriott and Starwood officially merge! Location. 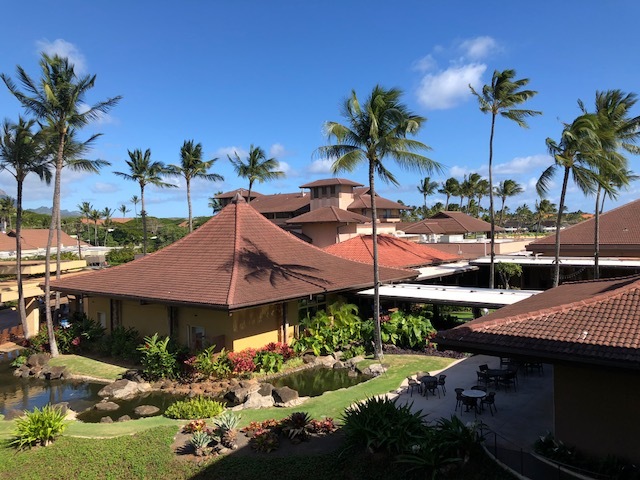 This is the only Starwood hotel in Poipu, and the location is great (the St. Regis, also Starwood, is located on the North Shore in Princeville, overlooking Hanalei Bay). 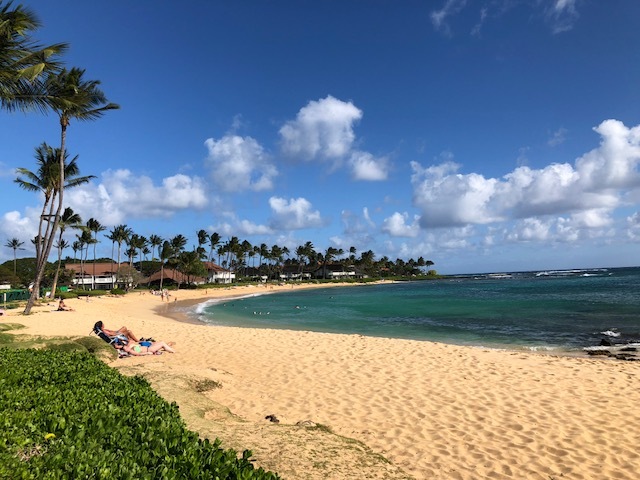 The hotel is right on the beach, and also close to two shopping centers – one, the Poipu Shopping Center, was walkable from our place (about 10-15 minutes) and a great spot to find breakfast. Staying in Poipu was the right decision for us, for what we had planned for this trip, but the North Shore has a more natural, remote atmosphere, and is equally beautiful. If staying for longer than a week, it might be tempting to split time between the two areas. Room. Since we booked free rooms, we had the lowest level, or the garden view room. For some reason we were upgraded to the Deluxe Garden View room (maybe they weren’t completely booked, or maybe it’s because we’re Gold members). It worked out well for us because we are in the Ocean Wing, but facing away from the ocean. It was still nice (though admittedly not nearly as nice as having an ocean view!) because we were closer to the restaurants and pool area. We’re a little confused about how the hotel works, because there appears to be an area across the street (away from the ocean). There’s also a portion of the hotel by the pool that is currently undergoing renovations. 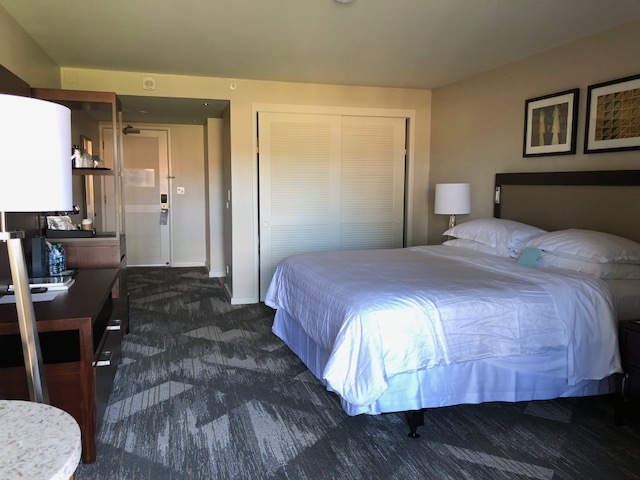 The room we were upgraded to was recently renovated, so that was another plus! In room we had a small fridge, hair dryer, ironing board + iron, and we requested and received a crib, but it’s smaller than a standard crib, and the rails are metal. So it was great for night time sleeping for Oliver, but not for naps because he would try to stand up before falling asleep. It’s just a skill he hasn’t quite mastered and I’m not wiling to let him fall and hit his head on metal. I almost wish we had brought our pack n play, but we made it work. The room also had robes, wine glasses (+ opener), a coffee/tea maker, etc…the essentials. Dining. Rum Fire is a dinner-only restaurant on the property and it is amazing – we ate there our first night and it was the best meal of the trip! We ended up returning for our last meal as well. They also have Lavas, which we frequented while hanging out at the pool (happy hour is from 3-5pm, and they will come out to the pool to serve you if you put your flag up, or you can do as we did and just order at the bar). We ate breakfast there (pricey but convenient – they have a buffet which isn’t much more than ordering straight from the breakfast menu) and had a few poolside snacks. The Sheraton has a small convenience store that’s open from 6:30am – 11pm, with small bites to eat/drink (including beer and wine to take out – like 6 packs and bottles), sundries, and souvenirs. This worked well when we wanted a quick and light breakfast (like on our way to out to Waimea Canyon). Amenities. The Sheraton is not a resort – it’s quite a bit different than the Westin Villas in Maui. There is a gym with treadmills, ellipticals, a weight machine, and some free weights. There are also a few dining options (as mentioned above). The best amenity is the amazing beach-view pool, which we frequented daily. They have rentals available for beach chairs and umbrellas, and they have towels (free) which can be used at the pool or at the beach. They also have a luau onsite, which we attended, but it’s not free. Overall we were very happy with our (almost) free stay at the Sheraton. While it’s not the nicest hotel we’ve stayed at, it’s good value, and a good option as a home base while you visit Kauai. If you want to spend more and are looking for a more luxurious stay, I would choose a different location, but I would not hesitate to stay here on a return trip! 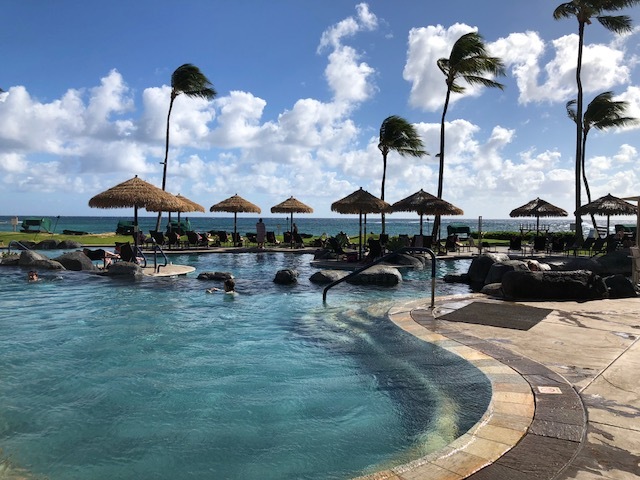 This entry was posted in Accommodations, Hotel Review, Travel and tagged Hawaii, hotel, Kauai, Kauai Trip 2018, Sheraton, USA by Kristin. Bookmark the permalink.